My own culture and upbringing has motivated me to learn my own language. 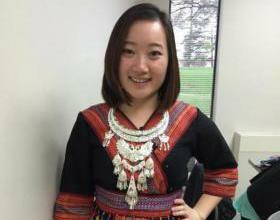 The loss of our native language within the newer generations had influenced my decision to learn Hmong and understand my culture. As a future healthcare provider, I would like to bridge the gaps between cross-cultural communications. After learning Hmong for 5 semesters, this had changed my perspectives on the Hmong culture and strengthen my relationship with my community along with my parents. I have a greater understanding of my parents and their hardships. This helped me build better communication skills with not only my parents as well as my grandparents because they speak no English. Discussion sessions. They are different from other classes I took because I feel very comfortable with my classmates and teacher. We were encouraged to ask questions on anything that we did not understand or weren’t clear to us. I enjoyed this class very much because it was not just memorizing terms and definition but rather, we had many open discussions. This gave us an opportunity to ask and learn more about the Hmong culture and listen to my classmates perspective on a certain topic within the Hmong culture and traditions. As cliche as it sounds, studying abroad has definitely open my eyes to the wonders of life and changed my life, for the better. I learned a lot about myself that I did not know I was capable of. Studying abroad has changed how I viewed the world and myself. This experience gave me a chance to find and love myself and taught me the value of life. Growing up, I knew how to speak Hmong, but they were not the correct pronunciations. I struggled to read and write in Hmong during my first and second semester. I was always embarrassed when I had to speak to the elders in the Hmong community because I was not confident nor comfortable speaking in Hmong. However, after completing sixth semester of Hmong, I am now more than comfortable conversing in Hmong with my grandparents and relatives. Start early and try to use it as much as possible.